Conceived as a way to showcase Philly’s comedy talent in a unique context, this premiere episode of Dates features comics Dan Vetrano and Kevin Ryan. As you may have noticed, things have been a little slower at WitOut lately. Between new, more demanding day jobs* and starting our own weekly show, Free For All*, we’ve unfortunately found ourselves with less and less time to devote to volunteering for the site. At the beginning of May we began transitioning out of our roles at WitOut, and will officially be done at the end of June. But don’t worry, that doesn’t mean WitOut is going away! As the site publisher, Philly Improv Theater is working to find new volunteers. Thanks to all of you who have read, supported and contributed to the site in the years we’ve been a part of it. We’ll miss being in touch with you all via WitOut, but we’ll still be involved in the Philly comedy community in many other ways, so we’ll see you around! *Hahahahaha you thought this was our day job? We wish. *Yep, that’s a hyperlink to more info on Free For All. (Ooh, and that’s another one!) We know it’s tacky, just go ahead and click it. 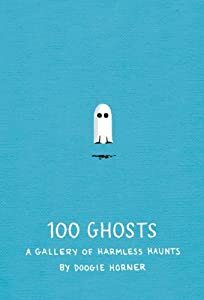 Stand-up comedian Doogie Horner has a new book, 100 Ghosts: A Gallery of Harmless Haunts, coming out this September—and GoodReads is giving away 50 free copies between now and July 17th! Enter to win here. P.S. If you don’t win, you can also pre-order 100 Ghosts on Amazon.